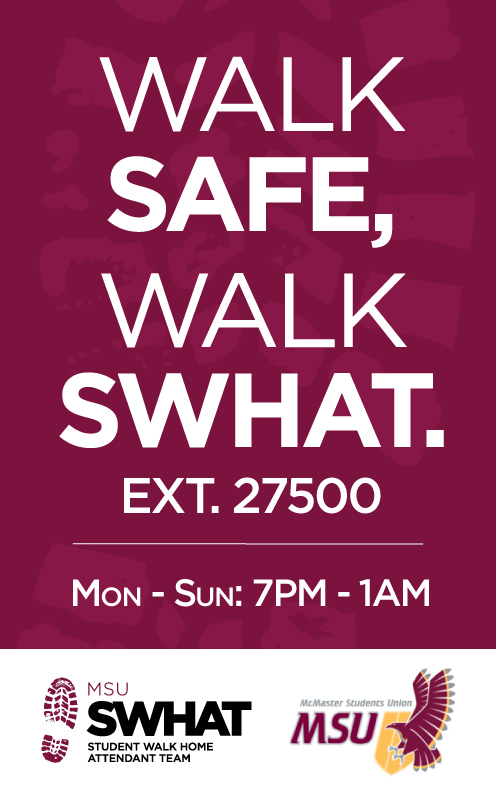 The Student Walk Home Attendant Team (SWHAT) is a volunteer service within the McMaster Students Union that will walk or bus with students during the evening hours 7 days a week. No matter the weather, our walkers can walk with you to your destination while providing safety and company (we also have umbrellas to help keep you dry!). SWHAT is run by student volunteers. When you call us, you will be joined by a team of two walkers, one male and female. They will not have obvious uniforms, but name tags for identification. As well, all walkers are equipped with a flashlight and a radio to allow communication with the SWHAT office and McMaster Security as required. When can I use SWHAT? SWHAT is open from September to April, 7 days a week! SWHAT will walk any McMaster student anywhere on campus or off campus from University Plaza to the 403 to the edge of the escarpment. We will even take the bus with you if requested. Check out this map of the McMaster area for a visual! How do I request a walk? You can drop by the SWHAT office located in the Student Centre (MUSC 234) or call us either with the office extension x27500 or the MUSST App and we can come to you! When requesting a walk, please keep in mind that our volunteers need to be back in our office by closing time. Can I volunteer for SWHAT? SWHAT is an excellent service to volunteer for! You meet great people, become involved with an important MSU service, get a little exercise and have lots of fun! For more information on volunteering with SWHAT, check out the “Join SWHAT” tab on the left. Open 7PM - 1AM, 7 days a week!